Syracuse University, home to the Institute for Veterans and Military Families (IVMF), today announced a $20 million gift from U.S. Navy veteran, Whitman School alumnus and Life Trustee Daniel D’Aniello ’68 and his wife, Gayle. 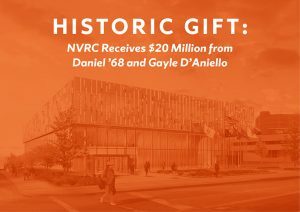 This gift, one of the single largest gifts in University history, will support construction of the National Veterans Resource Center (NVRC), a first-of-its-kind facility that will house the IVMF, the nation’s leading academic institute focused on the concerns of America’s more than 20 million veterans and their families as well as other veteran-focused educational, vocational and community engagement programs. 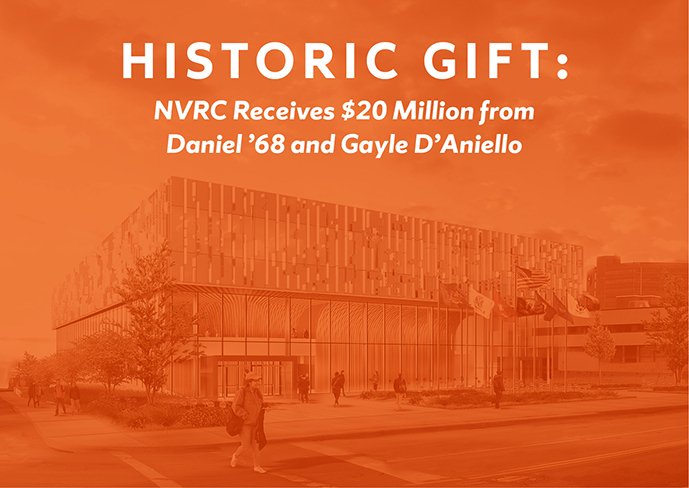 The NVRC will open in spring 2020. Chancellor Kent Syverud says the D’Aniello family’s gift is profoundly transformative and will allow Syracuse University to fulfill its promise of being the best place for veterans. Since its founding in 2011, more than 90,000 transitioning service members, veterans and military family members have participated in IVMF programs. The IVMF has pledged to place 30,000 veterans, transitioning service members and military spouses into desirable jobs by 2022 through its Onward to Opportunity-Veterans Career Transition Program. Daniel D’Aniello, co-founder and chairman emeritus of The Carlyle Group, served as a supply officer in the U.S. Navy aboard the U.S.S. Wasp (CVS 18) from 1968 to 1971. He went on to earn a graduate degree at the Harvard Business School, where he was a Teagle Foundation Fellow. In 2016, D’Aniello was awarded the U.S. Navy Memorial Foundation’s Lone Sailor Award for drawing upon his Sea Service experience to achieve success in his personal and professional life while exemplifying the core values of honor, courage and commitment. Citing his time at Syracuse University as life changing, D’Aniello says he’s honored to support his alma mater’s bold vision and ambitious goals. “Gayle and I are proud to be able to support current and future students, especially those who have and will serve in our nation’s armed forces,” says D’Aniello. Michael Haynie, Syracuse’s vice chancellor for strategic initiatives and innovation and IVMF’s executive director, says serving the nation’s veterans and their families is at the heart of the NVRC vision and mission. Syracuse University, via its Academic Strategic Plan, is committed to building on its long legacy of supporting the nation’s veterans and military families. For example, the University has the longest, continuously running Army ROTC program and is consistently placed among the best universities for veterans rankings. The National Veterans Resource Center (NVRC) will serve as a class-leading exemplar of academic, government and community collaboration and will build upon and advance Syracuse University’s already strong national leadership in the veterans community. The NVRC will house state-of-the-art vocational and educational programs designed to advance the economic success of the region’s and the nation’s veterans and military families, and also serve as a platform through which to seed, nurture and coordinate veteran-connected academic research and technology commercialization. The NVRC will also house the Syracuse University and Regional Student Veteran Resource Center; the Army Reserve Officer Training Corps; the Air Force Reserve Officer Training Corps; U.S. Department of Veterans Affairs “Vet-Success on Campus”; the National Center of Excellence for Veteran Business Ownership; Veteran Business Outreach Center and Accelerator; and Syracuse University’s Office of Veteran and Military Affairs. Designed as a LEED-certified facility and constructed in accordance with universal design practices, the NVRC will be an inclusive facility that welcomes and accommodates veterans and visitors with disabilities. To learn more about the NVRC, visit nvrc.syr.edu. The Institute for Veterans and Military Families (IVMF) is the first interdisciplinary national institute in higher education focused on the social, economic, education and policy issues impacting veterans and their families. Through its professional staff and experts, the IVMF delivers leading programs in career, vocational and entrepreneurship education and training while also conducting actionable research, policy analysis and program evaluations. The IVMF also supports communities through collective impact efforts that enhance delivery and access to services and care. The institute, supported by a distinguished advisory board, along with public and private partners, is committed to advancing the lives of those who have served in America’s armed forces and their families. For more information, visit ivmf.syracuse.edu and follow the IVMF on Facebook, Twitter and Instagram. Sarah Scalese is associate vice president for University Communications. In this capacity, she oversees the University’s Office of News Services, Office of Publications and the Office of Communications in the College of Arts and Sciences.